the last Democratic primary debate or forum was held on April 25 and no more are scheduled. Secretary Clinton "clinched" the Democratic nomination on June 6. Donald Trump, who clinched the Republican nomination on May 25 and began attacking Secretary Clinton immediately, was forced to step back and go into damage control due to various controversial statements. none of the television news hosts moderating the debates and forums asked Secretary Clinton a single question regarding the ET issue or the Rockefeller Initiative. John Podesta's strategy is to put out a number of somewhat vague statements that demonstrate the Clinton campaign considers the ET issue to be a serious matter. This is to protect his candidate should the media finally bite down hard on the issue. But these statements are carefully crafted to avoid igniting a media frenzy. However, if the political media choose to stay behind the truth embargo rope line - particularly the network news operations - he is prepared to coast all the way to the White House without saying anything more. Thus the silence since June 2. But this is just the lull before the storm. The print media are not contained. Reporters are continuing to put questions to the Clinton campaign and directly to Podesta and getting no response. More articles are on the way. One or more television news venues could make a move at any time. The journalistic equation under consideration is whether the convention delegates - particularly the super delegates - should be informed of the full story behind the Clinton/ET/Rockefeller Initiative connection before the convention nominating vote. Meanwhile, a plethora of negative developments are stirring around Clinton's candidacy. Time is running out for Podesta's dual strategy. The very nature of candidate Clinton's chief flaws requires her to speak truth to power on the ET issue. The storm is coming and taking shelter behind a wall of no comments will no longer be an option. 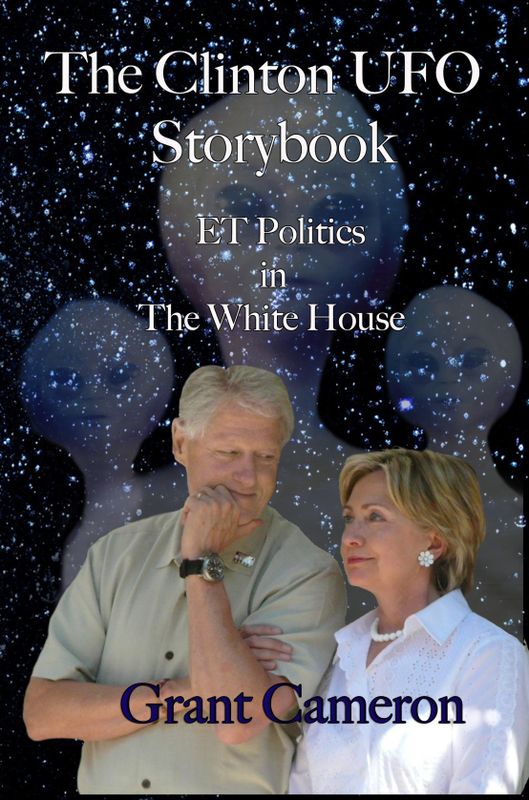 Canadian researcher Grant Cameron has just published The Clinton UFO Storybook: ET Politics in the White House. It includes, of course, an extended narrative of the Rockefeller Initiative (1993-1996). The book just happens to come out a few weeks before Secretary Hillary Clinton is to be nominated at the Democratic National Convention to be the next President of the United States - a coincidence surely. Who knew? Canadian exopolitical activist Victor Viggiani, working with Jo-Anne Eadie, has put together an important event for June 25 as part of the ACE Conference (June 24-26) in Brantford, Ontario, Canada (near Toronto). 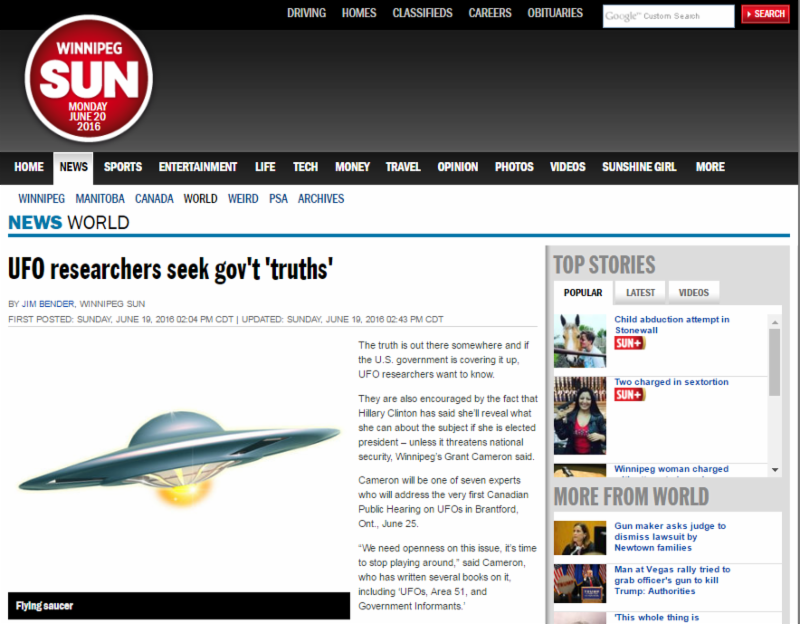 The Citizen Hearing on Disclosure (April 29-May 3, 2013) was a mock congressional hearing. This unusual event is not a press conference; it is a media hearing. A group of Canadian journalists from mainstream venues will question a panel of researchers, activists and witnesses for three hours. All aspects of the ET issue are on the table. The event will be filmed in high definition, and is expected to receive substantial coverage. PRG recommendation: come to Brantford if you can. Could be some history in the making. Note: Stephen Bassett is on the panel.